Mix the flour, eggs, butter, sugar, cocoa powder, baking powder, vanilla extract, and melted dark chocolate together in a metal bowl. Bake in the oven for 45 minutes at 170°C. Release the cake from the mold upside down, and coat in a layer of Nutella®. 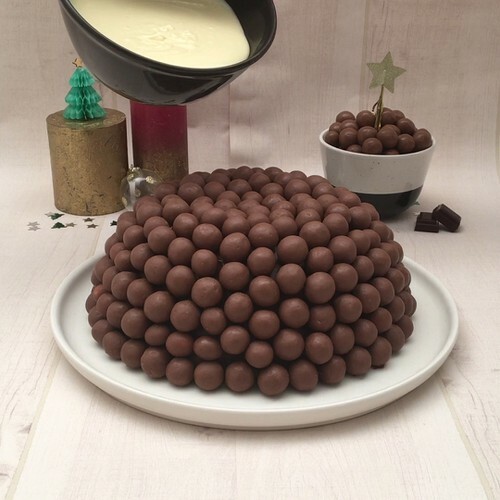 Then cover the whole cake in the Maltesers®. Melt the white chocolate and pour over the top of the cake, letting it drip down the sides of the bowl. Place 2 mint leaves on top and 3 glacé cherries, then serve the cake in slices. Merry Christmas!